Hillary Clinton started her comeback/ excuses tour to deflect blame from the terrible campaign she ran, which led the Democrats to lose what was a sure victory against Donald Trump. While Clinton continues to blame others for her mistakes, an excerpt of a book provides further evidence of how Clinton mismanaged her campaign. Almost four months after her stunning defeat, Hillary Clinton y primarily blamed her loss to President Donald Trump on four factors beyond her control. Similarly, Clinton would not have been harmed by John Podesta’s email, or any other information allegedly released due to Russia’s actions, if the email did not contain such incriminating information about the actions of Clinton and the DNC. There has not been any evidence of any false information being released. The hacked email primarily acted to reinforce what Clinton’s critics were saying. Clinton lost both to being a poor candidate and making many mistakes in running her campaign (which were also indicative of her inability to handle being president). One example was the mistakes she made in Michigan in the general election–having failed to learn from the her loss to Bernie Sanders in the Michigan primary. It was a difficult task for the Democrats to find a candidate so poor she would lose to a candidate as terrible as Donald Trump, but the Democrats, perhaps having a subconscious death wish, managed to do so when they rigged the system to nominate Clinton. There are two types of books about the 2016 election. There are books from Clinton partisans, which paint Clinton as the victim and blame Russia, James Comey, and/or misogyny. These books do a disservice to Democrats, blinding them as to why they lost an election which should have been easy to win against Donald Trump, and increase the risk of Democrats continuing to lose. Here are some excerpts from the review at The New York Times. In their compelling new book, “Shattered,” the journalists Jonathan Allen and Amie Parnes write Clinton’s loss suddenly made sense of all the reporting they had been doing for a year and a half — reporting that had turned up all sorts of “foreboding signs” that often seemed at odds, in real time, with indications that Clinton was the favorite to win. Although the Clinton campaign was widely covered, and many autopsies have been conducted in the last several months, the blow-by-blow details in “Shattered” — and the observations made here by campaign and Democratic Party insiders — are nothing less than devastating, sure to dismay not just her supporters but also everyone who cares about the outcome and momentous consequences of the election. Donald Trump is now looking like he is at risk of turning out to be one of the worst presidents in our history. Hillary Clinton, with her poor judgement and the blind support of many Democrats who ignore her mistakes andcorruption, very well could have done even more harm to the country. More at The Washington Post. Another review at NPR. Axios has a list of additional highlights. It is quite valuable how this book is changing the media narrative to a factual discussion of how Clinton mismanaged the campaign as opposed to continuing to hear Clinton’s excuses for why she lost. No matter how much Clinton supporters want to deny the facts, reality keeps intruding. Over the past several months multiple media fact checkers have verified the criticism that I, and many others, have made against Clinton. Government investigations, including the FBI and the State Department Inspector General, have verified Clinton’s violation of the rules and repeated lies to try to cover-up her actions. Wikileaks provided further confirmation of actions by both Clinton and the DNC. Possibly the most conclusive evidence the criticism of Clinton is valid is how she lost what should have been an easy to win election against a candidate as terrible as Donald Trump. The post-election attempts from the Clinton camp to blame Russian influence, James Comey, Bernie and/or Stein supporters, and others is just further evidence of Clinton’s dishonesty and unwillingness to ever take responsibility for her own mistakes. Donald Trump has been a failure, but we must keep in mind he is in office because the Democrats offered an alternative whose dishonesty, corruption, and poor judgement negated Trump’s negatives during the campaign, allowing Trump to win. In blaming James Comey, Clinton ignores the fact that James Comey would not have been investigating her in the first place if she had not grossly violated the rules regarding email and hadn’t handled classified information in a careless manner. The investigation further hurt Clinton as Comey’s report demonstrated she had repeatedly lied in her public statements about the matter. This gave further credence to her reputation of both seeing herself above the law and of being dishonest. She further hurt herself when she repeatedly lied about what James Comey had reported. Of course, the problems are not limited to 2016. Democrats also lost badly in 2010 and 2014 by ignoring principles and running as a Republican-lite party. By 2016 their presidential candidate was a major supporter of the Bush/Cheney agenda on interventionism, enlarging the surveillance state, economics, and limiting government transparency. Clinton had largely become the establishment Republican candidate, with support from the neoconservatives, running against Donald Trump’s outsider campaign. In their quick and Orwellian rewriting of the campaign history, the Clinton camp quickly moved from being in an election they could not lose to one in which multiple external factors conspired to make it an election which Hillary could not win. Even many Democrats continue to accept Clinton’s excuses and ignore what Andrew Sullivan calls, “one of the worst campaigns in recent history, leading to the Trump nightmare.” Matt Taibbi, who debunked the arguments from the Clinton camp that opposition to Clinton from Sanders’ supporters was based upon Russian propaganda, had excellent coverage of the race, which showed many of the weaknesses in Clinton and her campaign. 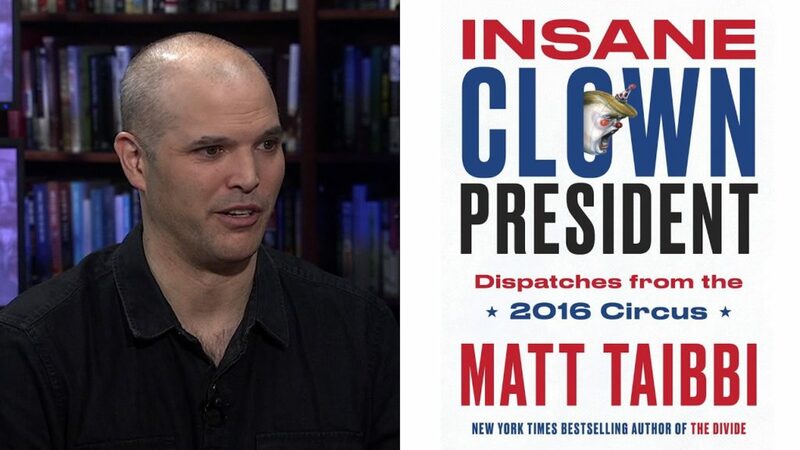 He collected some of his articles in the book Insane Clown President: Dispatches from the 2016 Circus. The book concludes with an epilogue which explains why Clinton lost.